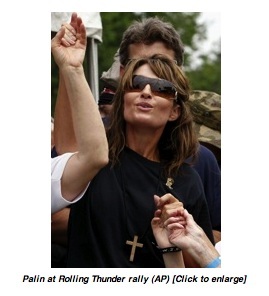 Whatever else is said about potential Republican presidential candidate Sarah Palin, there’s no question she knows her audiences. 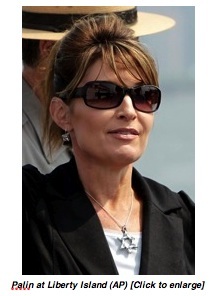 Mrs. Palin told reporters who asked about the prominent Jewish star pendant that she was trying to highlight the day during the 1967 war when Israel captured East Jerusalem, uniting the city under Israeli control. “Today is the 44th anniversary of Jerusalem being reunited. We want to call attention to that,” she said, according to several news reports. The Six-Day War commenced June 5, and the Temple Mount fell under Israeli control on June 7. Under the Hebrew calendar, though, it synchs up as June 1 and was celebrated by Israelis on Wednesday.